Following on from the stencil work on the main body and head, plus the golden edging, I have got to a similar stage on the shin pieces as well now. Hence this is just a brief update to show off the painting of these pieces to date. Clearly, there's still plenty of painting work yet to be done on these, including the Imperial Eagle, as well as assembling these pieces on to the titan itself. But that's a story for another day. Carrying on from the stencilling work that I undertook on the Warhound Titan, I decided that I would base coat the metal ridges and bodywork in a gold or brass colour. This serves to not only complement the green colours already present, but also frame the stencilling work in a way that makes it stand out in a good way. Clearly there is still a lot of work to do here in terms of highlighting, applying a bit of battle damage, wear and tear, and all the rest of the usual process that you might imagine. But its really starting to look like the end is in sight. I'm aiming for the end of June. We'll see if that happens! One of the things that I purchased my airbrush for a long time ago was to do some stencil work. With my titan already base coated, I found the perfect excuse to try some stencilling out. 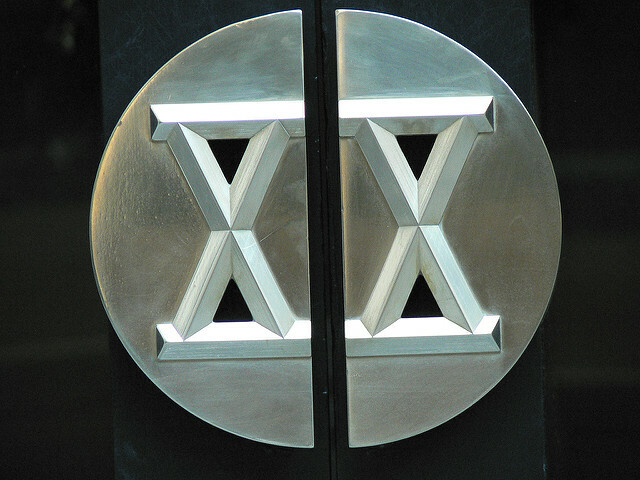 Here, I'm using some of Anarchy's stencils -- in this case a hex grid. The first image shows me lining up the stencil over the upper carapace of my Warhound titan. I then attach in in place with a combination of masking tape (the sort that doesn't rip paint off!) and blu tac (again - applied lightly to not rip the under coat or base layer off). The colour I'm using here for the stencil work is a creamy off-white colour. I chose this to be a nice complement to the green base layer that I've already airbrushed in to place on the titan. The results are very nice. I did go a little bit wrong as I sprayed around the curve of the carapace though - some of the paint leaked at an angle. I should have been more aware of this -- the tip here is to always be at 90 degrees to the surface that you are stencilling. Or at least be at a consistent angle. Still, a little bit of detailed paint with a triple zero sized brush tidied it up to an acceptable level. I'm sure once I've applied a little bit of weathering it will hardly be noticeable at all. And I capped it off by stencilling half of the head / pilot unit as well. The idea here is that the iconography will occupy one half of the upper carapace and the stencil work the other half. That way, it'll look very identifiable on the battlefield and give it a little bit of a "pop" to stand out against other titans (if needed!). Later work will include going around the "edges" of the bodywork and selecting a different colour for this (I'm thinking gold or brass to complement the green). So, I've reviewed everything now in Tempest, and this is the last entry. The Warlord Titan. I've done the Reaver and the Warhound, so for completeness, I'm now doing the Warlord. In terms of background, and at the time of writing, the cost of this beast is GBP 1240. Do you need more background? Okay, its points cost is 2750 at the base level. I would like you to have a good hard look at those numbers. Are you going to use it in a game? Are you rich enough not to care? Right, now that we have got that out of the way, the Warlord is the largest of the battle titan class and one of the most iconic. In the background blurb, it hints that it is the Warlord that is primarily responsible for the domain of man, rather than the space marine legions. And with the rules presented, its not hard to see why. Oh my. Where to start. Look, this machine is an absolute game killer. And city killer. With a game breaking AV=15 on two faces, a whopping 30 hull points, 6 void shields, 5++, and all the usual titan rules you've come to expect, I'm not even sure how to bring a Warlord down short of fielding one against it myself. Other than that, we get to choose two arm weapons and two carapace weapons. And yes: there is choice here. Note as well, the Warlord can simply target blank areas. That gets around invisibility very nicely. The weapons are all viable in various combinations. For the arms, I like the sun fury plasma annihilators and the bellicose pattern volcano cannons most myself. I don't like the close combat weapon (the shooting is better, and you've got a great stomp attack anyway and can't be locked in combat regardless -- even by another titan. Hence I think taking ranged weapons is better). For the carapace, I like the apocalyptic missile launchers, the reaver melta cannons, vortex missile banks, laser blasters, and incinerator missile banks (for opponents in very hard cover). Yeah. It explodes with a large radius? Erm. Okay. Moving on. Here's just a couple of my personal favourites. To be clear, I don't think you can go tooooo wrong here. You just have to ask yourself what you're going to be up against. Lots of D class ranged weapons. For the primary weapons that is. I've got nothing to add here. I don't even like this build. I'm just including it to demonstrate that such builds are still viable. The Domitar is an upgraded version of what the book calls the "ancient" conquerer design of robot (which I thought was a nice nod to the Rogue Trader era 40k!) that was brought out just prior to the Heresy happening. These robots are a really nice addition to the range as they fill in the elites spot very nicely and are able to take on marines, terminators, tanks, buildings, and most other things in between. They're a close combat beast, but one that needs some placement thought and management. I see two primary strengths here. The first one is the obvious close combat role with a pair of graviton hammers that ensures high strength and low AP, coupled with forcing disordered charges against them. And did we mention d3 hammer of wraths -- that's great! The second is that they provide some well-needed anti-air cover in the form of flak missiles. Clearly this is might be needed in some builds more than others. For the points, if these guys charge the wrong unit, they're going to regret it. They will also regret tar-pitting units. Hence they need to have some well-thought through targets to charge in to and handle. Pricey, but a really nice use of paragon of metal in the right situation. Wow -- expensive for what you get, but capable of taking almost anything on in the game. Placement is going to be an issue though. The growing tensions between Ryza and Estaban III resulted in the latter creating the Cynis variant of the Thanatar. The main problem was that they lacked Ryza's mastery of plasma mechanics, and as a result the Cynis has always been considered a bit more erratic and possibly malevolent in comparison to Ryza's attempts. Unlike the Calix variant, the Cynis can be taken in multiples to form a maniple of up to three of these amazing machines. If you can find a way to infiltrate them, then they will prove (in all likelihood) devastating to all around them. This will be accomplished by their Cynis pattern plasma ejectors. They pack two of them, and each can lay down two S8 AP2 blasts. Four S8 blasts are horrific for most armies to contend with and they can affect (or have the chance to affect) almost anything in the game. Twelve of them are just insane. Couple this with the plasma wave special rule that forces cover saves to be re-rolled, and we're looking at a unit that can wipe out even terminators camped on objectives inside very hard cover. The mauler bolt cannon is pretty nice on top of this. The major drawback of the plasma ejectors is their range. At 18 inches, the threat range is smaller than a regular bolter, and the Cyris needs to think carefully about where to lay down their amazing plasma storm. On top of this, the gets hot rule is an ever-present issue that might merit some attention. Arguably, the best way to play them is to get these Cynis in range of enemies pretty fast and blow them away. Getting them in range may prove an issue. Hence we need to think about that. Infiltrate or equivalent would be beastly here if possible to pull off somehow. Here are a couple of builds to think about. Thanatar Cynis, paragon of metal (305 points). Deadly! And a good distraction to boot as well. Thanatar Cynis, searchlight, enhanced targetting array (291 points). You will like searchlights after playing night fighting against Night Lords a few times. 3 Thanatar Cynis (825 points). Laugh or cry, this is a valid unit entry for Horus Heresy. This robot is what happens when you combine together the know-how of some of the most secretive and advanced mechanicum factions in one lucid dream of destruction. Rare and in some quarters: sacred, these machines of destruction live up to their background on the tabletop! There are some really nice weapons on the Thanatar, including a lascannon, the dreaded graviton ram, and a mauler cannon. All at BS4. The WS is a bit lower though, and hence this machine is not quite as good as you might want it to be in close combat. Combined with only two attacks, the natural S=8 is a bit on the wasted side arguably. The equally high toughness combined with many wounds and its saves give this guy a huge survivability in the game. Combined with cybernetics resilience, not even poison is going to do too much damage to these machines. One of the main problems with this Thanatar is what range to place him (her) at. Take for example the weapons. The lascannon has a long range and so can happily sit back and shoot away. The others do not have that luxury, so you are forced to move forward to make use of them. In doing so, you run the risk of getting tar-pitted (which is certainly what I might look to do against them in the game). Although this unit is excellent against buildings, there is hardly any call for this in games as they exist at the moment. I look forward to seeing them deployed in cities of death though or boards with a large amount of buildings in close proximity to each other. To be honest, I think I'd sooner spend points on other machines and robots overall, despite how survivable this particular machine actually is. The basic and naked build is totally viable in Horus Heresy. Thanatar-Calix with Paragon of Metal (330 points). Probably about as many points as you want to spend (unless you really want the searchlight and the enhanced targeting array). This can be a beast on the board. But I regard it as a huge points sink and think other army selections get a better return on their points. With an intelligence that some within the Mechanicum consider to be on the borderline of an abomination of animated silicon wafers, the Scyllax are written to be highly durable, intelligent with a full battlefield role. That said, they are comparatively rare and typically serve as bodyguards of the high ranking Domina. With 2 wounds each and toughness of 5, these machines are tough and relatively worth their points in the stat line department alone. The have access to fearless so long as they're within range of a cortex controller (or suitable Iron Warrior with the battle smith special rule). Their close combat array is interesting as it can generate extra hits on wound rolls of 6, or be substituted for an enhanced strength and AP singular hit which is well worth while if they're going to up against terminators or terminator equivalents. As if these weren't good enough, they get a bolter with a better AP and longer range, coupled with a rad furnace engine that gives the usual radiation poisoning penalty to opponents in melee. Blimey! I would have preferred them to be a lot faster frankly. That way they could have been superlatively deadly. I think they're going to need some kind of transport and they probably want to be with a high ranking Dominus. If they do happen to be outside the nominal range from a cortex controller, then they don't move either. That could be bad. Particularly with average Ld. 16 Scyallax, frag grenades (565 points). A large squad for killing lots of things in combat or with their bolters. Take a Triaros for transport to taste? Relentless with rapid fire is very nice here regardless. 10 Scyllax, frag grenades, Volkite Chargers (445 points). With volkite, we need to have lots of them equipped with them to make the most of it. 5 Scyllax, frag grenades, 1 graviton gun (195 points). Cheaper than terminators are possibly a bit better assuming you have a cortex controller somewhere nearby and you can get in close combat to use their high S hit against T=3 terminators (reduced thanks to all that radiation) -- instant killing as well in all likelihood. I like this arrangement, but feel free to swap out the graviton gun for a plasma gun or a melta gun to taste. Lurking in the classics section of Warhammer World is this little diorama. Its of The Rock -- the Tower of Angels -- the last remnants of Caliban that the Dark Angels inhabit. The background and the models mark it out as in the earlier years of 40k, but interestingly to me, it is already apparent that the paint work in the diorama is edging away from bright and glorious colours, to something a bit more moody, and grim-dark in tone and nature. For this reason, I find the diorama fascinating as it echoes what is to come in terms of the realism that the painting team at Games Workshop later went for over the almost festival like colours of clean and pristine marines earlier on. "Wait, what do you mean? Its not Khornemas yet, mate!" "Sure it is, its always Khornemas!" "Oh, well, in that case, happy Khornemas and blood tidings to you too." "Wait, hold on. You don't need to do that. Wait…"
Many will know this dilemma in a variety of guises. You've assembled the miniatures you want. You've undercoated them black (or grey, or white). And now you're looking at it seriously. What colour do I want to paint my forces? I mean, we all thought we liked red a lot. But then blue sounded excellent. Some of us even thought yellow would be neat. I faced this issue myself with my Warhound Titan. To decide what colour it would be, I turned to the background. I want my titan to belong to the Legio Perennia. Now, this is a titan legion that very little is known about in terms of heraldry or colours. I kind of like this as it leaves the door wide open to what colours it could be painted in. Simultaneously, it provides a dilemma. What colour do I want? Why can't I decide? Then I thought about the name "Perennia". To me, it has overtones of "perennial". As in the plants. You know, perennials are the type of plant that live for more than 2 years. And of them, there is a subset -- the evergreens -- that are ever green. Green! And that was the extent of my logic that decided the base colour. And besides, apart from Death Guard in 40k, I've not really worked with green too extensively (at least in a neat, clean and not Nurgle's Rot kind of manner). Turning to the air compressor, I applied a layer of Vallejo green to the black undercoated and silver highlighted base layer. 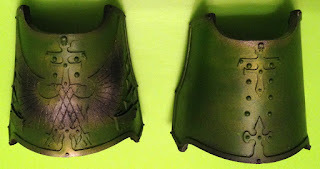 The green layer is thin enough that the silver highlights I had previously sprayed on can be seen through the green layer, creating a metallic green appearance and hints of how the metal pieces have been bent in to shape during manufacturing! Or at least that's what I'm trying to communicate here. Hope you like it and the effect! It is not finished yet. But its getting rather close! I'm just going to leave this picture here and the link to the base coat stage so you can see the difference. Note the lighting here is artificial -- it looks a hell of a lot better in natural daylight -- the blue really sparkles. To say that I've spent a long time painting this miniature would be an understatement. It's becoming so close to being finished now! This post follows on from my earlier thoughts about how to potentially utilise Dynat with Coils of the Hydra. Fundamentally, the Alpha Legion is so very flexible that we can build many rites of war from them and not really suffer too many draw backs. Although the Raven Guard may pull off the Orbital Assault better than the Alpha Legion thanks to their legion special rules, Dynat is what gives the Alpha Legion the edge (potentially) in this style of play. The fundamental idea behind this list is to hem-in the enemy using the drop pods inside their own deployment zone. This will enable Dynat's special rules to come to the fore and harrow the enemy to death where they stand. To pull it off though, it necessitates an enemy who themselves is not using something like Orbital Assault or lots of infiltrators. In that case (or the mirror match), it is either vital to force the enemy to deploy in their own zone, or to force them to go second. Neither is impossible, but against a Raven Guard drop pod army, this one might struggle. But at least it has an edge on static gun line armies, and on none-drop pod ones. It is also important to note here that all units must have deep strike. It doesn't necessitate that every unit must enter play via deep strike, only that every unit must have access to it. Hence I want some units that could potentially be deployed in a traditional manner to ensure that I'm not wiped off the board with lots of units still in reserve. This is a list that has some flexibility build in. There are 3 drop pods, meaning any two of them can be selected as first wave. Its not a list that is going to be blow off the board on the first turn either. It has durability. Dynat goes with the support squad in their drop pod and provides a bonus to BS when they land. Hopefully they'll blow up something valuable. The other drop pod will be the contemptor if some close combat back up is needed for handling terminators, or the heavy support squad for more vehicular damage. The big troop blob goes inside the storm eagle whilst the assault squad moves up the board as required in a flexible role. There are plenty of power armoured bodies here (42) with armour and dreadnoughts for back up. In terms of the Alpha Legion special rules, this is one to use with either Tank Hunters (preferred), or with Adamantium Will (as required given the situation). Its not a traditional Alpha Legion infantry force that infiltrates: instead it is a rapid moving and hemming-in force to harrow and destroy in force the enemy one component at a time with unassailable force. This is one of the most impressive dioramas that I've seen constructed. Not the biggest, to be clear, but one of the best. The Tau here are defending one of their bases from an assault by the Imperium, including Mechanicum and Titans to boot. I think I'll just let the pictures do the talking and leave it here! Two weeks ago, I started a poll on Warpstone Flux to ask "Which legion is the most powerful?". This was supposed to be a 30k question, as emphasized in my original post, but I suspect that there are inherent biases and favouritism's in the poll results that I will try to explore below, before drawing some conclusions from it. Firstly, here is a graphic of the poll result. There were 183 votes across the two weeks, and users were permitted to vote for more than one legion. From the graphic alone, it seems that the clear the Alpha Legion is the winner of this poll with a whopping 22% of the total voting. So perhaps we'll start with my own first caveat in all of this. I've made no secret of the fact that I'm building an Alpha Legion army of my own. This was a fluff driven choice and a painting challenge driven choice for me, with the rules coming in a distant third. I've even won a game or two with them against my friends in the local league (as also blogged here!). Hence, my concern here that the Alpha Legion "won" is that I've given this particular legion a lot of attention here on Warpstone Flux in comparison to the other legions. For example, I have painting guides on the Alpha Legion, as well as iconographic techniques I've used. I cannot say similar for the Salamanders (etc.). At the other end of the scale are the Thousand Sons. Now, the thing to note here is that their rules and special characters are yet to be released. Perhaps we'll see some hints at the upcoming GW weekender on this. Hence, we should at least regard the Thousand Sons votes as some kind of lower limit on the "noise" of the voting. Fractionally above them, we have the Space Wolves. 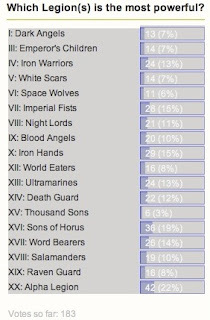 Also without rules or characters at present, they have polled almost as well as the Dark Angels and the Emperor's Children. I find this really odd: a legion without rules does almost as well as the Emperor's Children who have had rules since the publication of the first book in the series, Betrayal. I would think there are at least some players voting for the Space Wolves just because its their legion (and that would apply to other legions too … hence I have an increased concern about the Alpha's winning this poll. I think they might have manipulated it (!) (joking). Let's have a look at the legions in turn from herein. The Dark Angels have polled rather poorly overall. Their rules so far mark them out as a somewhat plain legion with a bonus in close combat which is nice, but not overwhelming. I personally think the iron wing and raven wing protocols for their rites of war are rather powerful (especially raven wing). But I can see that their lack of special rules coupled with being rather vanilla (even if they get all the cool new toys) would make them lower ranked than others. I guess we just have to wait to see what special units are brought their way and how the Lion is written up. The Iron Warriors did very well. And I'm inclined to agree. I personally think these guys are the baseline legion to which everything should be measured against. In a playing environment lacking "And They Shall Know No Fear", their re-rolls of morale tests is amazing. Add to that tasty special units and reasonable rites of war, and I agree with the wisdom of the masses that conclude this is a strong legion. Another legion we know only a little about are the White Scars. They've done almost as poorly as the Emperor's Children, but I think we will live to regret that polling once we learn of their special units. Their ability to move so fast and gain bonuses from moving very fast is strong with the correct army build. Think: lots of jet bikes! I'll skip Space Wolves due to the earlier comments. Let's wait and see. The Imperial Fists rightly have polled very well and once again show that almost "vanilla" marines can really be very characterful and very strong in game terms. Good at shooting, good in melee, they outshine a lot of others in the game. 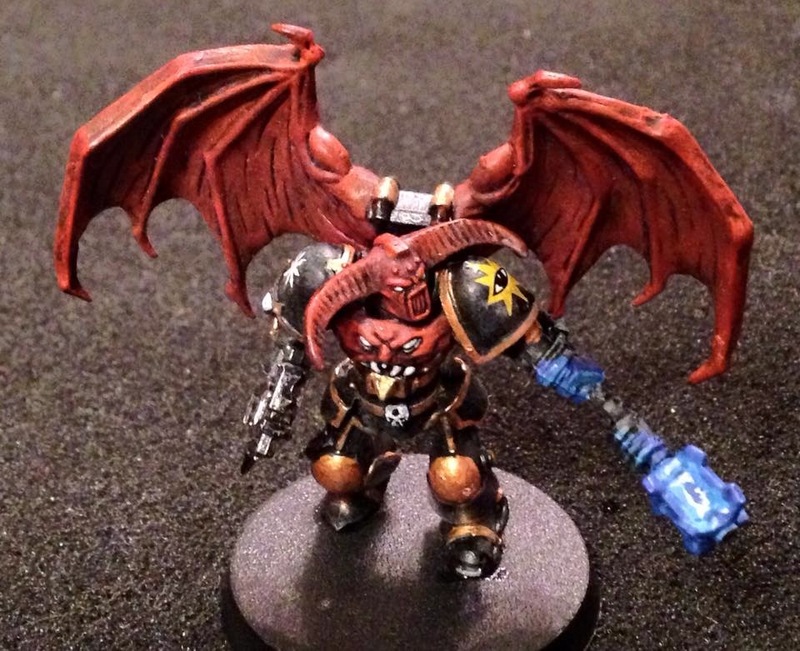 The Night Lords did okay -- but perhaps not as well as I might have thought. I accept that they're not top tier, but used in a well thought through build (e.g., constructed around fear), they can really shine very well indeed. There are draw backs though. Just that Nostraman Blood alone is a big negative! With Encarmine Fury, the Blood Angels are really rather good in melee. And as a consequence they have polled almost as well as the Night Lords. Can't wait to see what special units are in store for this legion as I feel that they could readily shoot up the rankings with certain builds. They're very recognisable to 40k players, but in 30k, they're probably even better. Now to the Iron Hands. Rightly, this legion has polled very high. Their inviolate armour is probably what gives them such a big edge over their opponents, coupled with their penchant for heavy machines. They are really a top tier army. Good thing Horus has the foresight to smash them at Isstvaan really. And a good thing for the loyalists that they remained loyal too I'd say. They're certainly near the top of my list for having been "too close to Horus". The World Eaters didn't do so well. But Equally this is probably due to having to "trigger" their special rules inside of melee. Equally, after Isstvaan, this arguably gets a little bit better. Add in the exhortations of butchery to blood madness, and they're actually really rather good! 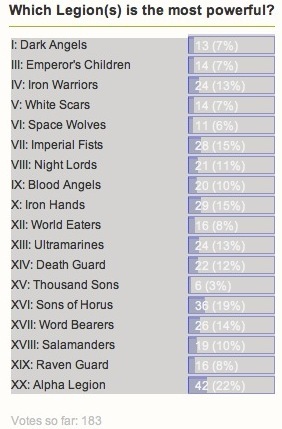 So I guess the poll depends on what period of World Eaters we're talking about. Prior to the betrayal, they're not that good. But after, they just get better and better. Did we mention free chain axes? Ultramarines are an odd one to me. They polled very reasonably. But I find their rules a bit clunky. I really like their rules, but I can see opponents just gunning for their HQs all of the time to get the pinning penalty applied to at least some units. They have strengths, but they also have weaknesses. Much like the Night Lords in many respects. The do take fear tests at Ld=10 at least. So they're rather good, and have a good selection of special units that I'm sure the Alpha's would just love to have. The Death Guard have always been solid and their polling result supports this. They may be slow, but they certainly hit hard, and using the correct rite of war can lay down a withering amount of shots that will often take other legions by surprise. And they are immune to fear and pinning. This is amazing really! Plus they don't care about using deadly rad weapons. I think if anything, they should have polled a little higher. I'll skip the Thousand Sons due to the earlier comments (similar to Space Wolves!). Let's wait and see once more. Then we have the Sons of Horus. These guys polled really well -- second only to the Alpha Legion. They are really good in close combat and are good at close range as well. This means the Sons are usually a swift force that orients itself around close combat and getting in to combat quickly. I actually see them as quite balanced, but played in the right way can be deadly. But are they really any more deadly than the World Eaters or the Emperor's Children in their own way? I'm not so sure. They're good, and certainly top tier, but perhaps over polled in my humble opinion. (Now watch me regularly lose games to them! lol!). As for the Word Bearers, their ability to summon (or even take as allies) daemons is remarkable. On top of this, they're actually not too bad in combat either thanks to "cut them down". Plus their belief in themselves gives them a good bonus to morale check. Nothing like the Salamanders, of course, but really good in their own right. I think this is a legion that is made special because of the unique things that they can do, rather than their rules. And they're the best in the psychic department until we see the Thousand Sons published. So their polling as mid to upper tier is probably about right to me. The Salamanders are noted for having the thunder hammer and storm shield terminators -- unlike other legions. Their polling is on the lower range though. They do have good bonuses around heat based weapons which is very fluffy and have the closest possible to "And They Shall Know No Fear" in the game. They're balanced, but I think their polling result is probably about right. The Raven Guard didn't poll as well as I might have expected. I really thought that their combination of special rules would give them an edge in this poll to be honest. Go first, kill the independent characters, and alpha strike the opponent off the board is a very viable tactic for this legion and one that can certainly be brought to bear with their rules. I'm personally disappointed to see such a low polling for them. Finally the Alpha Legion. I think they have over polled for some of the reasons suggested above. Equally, they are adaptable, so you never quite know how they'll react once the opponent has seen your army list. Plus they have some nice toys (bane strike ammo, plus that power dagger that can cheaply give them an extra attack in close combat for characters). What sets them apart is the coils of the hydra rite of war. The ability to steal other's units is amazing. But the army needs to be built correctly around it to fully exploit. The main drawback is that otherwise, they're just standard marines, and don't have any of the concentrated bonuses of other legions. Sons of Horus, Alpha Legion, Iron Hands and Imperial Fists. Dark Angels, Emperor's Children, White Scars, World Eaters, Salamanders and Raven Guard. I'm not placing Space Wolves or Thousand Sons for obvious reasons. Also, I feel that the Emperor's Children are decidedly not low tier. But that's just my opinion. I wonder how this will change in the future? I might do another poll in a few months down the line to see how things have changed. In the meantime, what do you think? Have the masses got the right result? Are some legions too high or too lowly placed in you opinions? You know mine, so I'd love to hear what your opinions are. (Be polite, and remember that minors read this blog please). The Warhound Titan (or indeed any large model) can be very daunting to paint. Not only is there a HUGE surface area to cover, but there's also the question of how to paint it reasonably well in a half decent amount of time. The only answer to these questions for me is to use airbrushes or spray cans. For the Titan, I used a base coat of citadel spray can black everywhere. I literally soaked the Titan from every angle to ensure that it all was covered in a quality black undercoat. This is where all the scrubbing at the start pays off -- the black undercoat stuck perfectly well to the resin of the Titan except in just one or two minor (meaning millimetres) patches. I'm not bothered by these few random regions to be honest. The black undercoat looked very good! From there, I used my regular airbrush with a dose of watered down (and specifically thinned) rune fang silver to apply the first layer. In the pictures, this layer can be seen lying on top of the black for the carapace of the Titan, as well as the greaves and the top plate. One thing to note here is that the silver has not been evenly applied. This is totally intentional and not some trick of photography. In the image top plate especially, it is plain to see that there are certain horizontal lines where I've gone over the black with a rather thick coat of the silver. In other locations, I've left a lot of the black showing through. On the greaves, there is a lot of silver toward the top and along the central vertical line. The aim here is that when I apply the first colour layer, it will have a bit of a gradient to it. Ranging from very bright at the curves of the Titan, to duller (darker) in the centre of the plain regions. This will eventually give the titan something of a colour gradient to enhance what is already there in terms of the topography of the miniature itself. Can't wait to get to the next stage! Hurry up and dry thoroughly! More painting progress, and this time it is the Princeps and Moderati of my Warhound Titan, Novacula Occulta. The Princeps goes by the name of Alpharius (naturally), following the seizure of the Legio Perennia titans in the events that are depicted in the Horus Heresy short story, The Harrowing. For these miniatures, I wanted a colour scheme that set them apart from the usual grey fatigues and bronzed helmets that I'm used to seeing on such miniatures. Hence I opted for muted greens on the body work, coupled with a bright silver helmet and a scarlet red military coat on the Princeps. The part of the painting that I'm most proud of is the normal eye of the Princeps. If you look closely, you'll see that not only have I got the white of the eye just about right, but I actually managed to get a steady enough hand to make the dot of the eye in the centre. The more observant will see that its not black either -- its very dark blue, to give it a bit more character. The beard and moustache is another highlight that I very much like here. A black undercoat followed by selective (and predominantly) white highlighting has lead to a quality of facial hair that suggests most of the colour has gone out of it due to age, but there are some black hairs still left over that haven't yet turned white. The skin is also complements this colouring nicely with a wash of flesh shade giving it a nice tone (I particularly like the right hand of the un-gloved Moderati). Overall, I'm pleased with the quality here and will be gluing these men in to place in the command cockpit of the Warhound Titan very soon. I really don't know why I put myself through this. I should just purchase the transfer sheet from Forge World for the Alpha Legion and be done with it I think. But over the weekend, the thought popped in to my head "you don't need an expensive transfer sheet! You could just paint it yourself!" And so begins the pain. For this bit of freehand, I just applied a few dots for the tip and corners of the "A" and the extreme edges of the Omega and proceeded to connect them up. I made the right side of the "A" slightly thicker to give the impression of a certain font, and then proceeded to go over this several times with progressively lighter colours. A final coat of gunmetal blue provided the clear division between the weave of the letters. Overall, its not so bad for the first bit of freehand I've applied in a long while, but I clearly need to improve my game a little bit on this front! Following my earlier recipe for Alpha Legion metallic blue, I've now reached the stage of base coating my Storm Eagle. Given the recent "heat wave" (I use the term loosely), I thought an outdoor photograph would do justice to the spray painting from the air gun much more than indoor lights. As can be seen, the spray painting is not 100% even (due to the silver layer as well as the gunmetal blue layer), but that is to my liking at this stage. I will apply a little bit more layering on individual metal plates in the next round of painting with a wash to give the craft a bit more of a gradient on each panel. This will then be followed with some iconography and general highlighting plus battle damage. In the mean time, I hope that the image shows how successful a gun metal blue colour scheme can work for the Alpha Legion. Its not nearly as "bright" as the metallic blue that Forge World uses in their promotion shots for the Alpha Legion, but I much prefer this scheme as its a lot more grim and dark (plus foreboding and striking) than the cleaner bright blue. One of the problems that I had with finishing off the connection between the torso of my Warhound titan and its legs was the hip pistons. I think I might have inadvertently pivoted the legs a little bit too far back at the hips. The downside is that the hip piston (pictured in the centre of the image) did not have enough length to connect to the ball and socket style joint that it was meant to. It took a while for the solution to dawn on me. But it was really simple in the end. At the rear of the titan, I had to cut short the hip pistons to make them fit as they were very compressed in comparison to the front. I literally took one of these off-cuts and pinned it used a paper clip to the main extensible part of the piston at the front. Voila - an extended hip piston. I think the job is very reasonable and the join hardly shows at all on the final assembly. The Warhound Titan has grown overnight! With the torso complete, the next most natural step was to attach it to the legs. Drilling a hole through the hips, I used the scoring technique to ensure a good bond with the hips and legs (the ball and socket style joint) and attached the legs. This step was actually relatively easy and quick to do. What was hard was to judge the angle at which to attach the legs at so that they remained flat (or at their intended angle) with the ground. The photograph shows the end result of this with the Titan now fully standing and supporting its own substantial weight on the legs. I'm very excited to have reached this stage(*) and the next few steps will involve completing the head I think. I'll then attach the armoured legs and top plate. One thing that I'm worried about is painting it. Should I paint the legs prior to attaching the shin guards for instance? Any thoughts on that would be appreciated. In putting together my Warhound Titan, I wanted to create a very VERY secure join on the hips of the titan to ensure structural integrity. The joint in question is a ball-and-socket style one, similar in nature to a human shoulder or hip. So, as well as pinning the joint using a brass rod (as pictured below), to create an even better joint, the image shows that I have scored the ball (and not pictured: the socket as well) with multiple strikes of my modelling knife. This is not just in one direction either -- I've created a criss-cross of scores much like the visage of Lucius the Eternal. Why do this? Well, the scores across the ball-and-socket ensure that the glue grips a whole lot better than it would otherwise do on a relatively smooth spherical surface going in to a smooth concave socket. Not only will the glue run down these scores in rivulets, but the added friction they provide ensures that the pinning I'm doing won't budge a millimetre once its in place and fixed. Its a very simple thing to do, and a technique that I've personally been using for many, many years. But it occurred to me after a conversation with some friends that its not one that might be widely known about. Hence I hope folks out there have found this useful and insightful if they didn't already know about it! This is one of those models that has been hanging around in my collection for a very long while in a half-assembled state. I finally managed to get this Heldrake finished off this week and thought I'd quickly post an image of it. I've not done any real conversion work here, but I did pin the wings on to the main torso of the beast for added structural stability. I think if I were to make one again (which I certainly might!) I'll be undertaking some serious conversion work on it and try to (somehow) magnetise the main weapon so that I can interchange them. This one has been built with the bale flamer. Given what we've seen come out of Forge World open days, I'm also wondering what the Heldrake might have looked like back in 30k (given that we've seen what the blight drone looks like in 30k). Not sure yet to be honest. The main reason I got this one completed was to loan it to one of my gaming friends for the upcoming narrative planetary empires campaign we're going to be running very soon. I'll be playing my Alpha Legion, and he's going to be playing 40k chaos space marines with daemon allies. Probably a focus on Khorne as well. The other players are likely to be eldar and Space Wolves, although that remains to be seen. I think my mate will like what the Heldrake can do on the battlefield against these armies! There won't be time to paint it before the tournament sadly, but I'm certainly thinking that it might be Khorne like colours (reds, blacks, brass) that I use for it. I am genuinely very happy with Games Workshop right now! They have followed through with their promise on their re-invigorated Facebook groups to address the frequently asked questions for not only Age of Sigmar, but also (as of an hour ish ago) Warhammer 40k as well! I'm really pleased with this development! Whilst I might not like some of the answers (eg only 1 grenade being allowed in close combat), they are very well written. GW is asking for feedback on the clarity of the new FAQ right now. So head over there and comment on it! NB they're not asking if you like the rulings, only is they're understandable! The long weekend allowed me to finally get the torso of my Warhound Titan glued and pinned together. Due to slight warpage of the parts, there is a 1mm to 2mm gap in some of the parts. This is nowhere near as serious as I experienced with the Storm Eagle recently, and will be readily hidden in the final model when the outer plates are placed on to it. I'm also very glad that I painted the interior of the titan's torso as there's no way I could do it now all the pieces are assembled together! This model is really coming together now. The legs will be attached soon and then its on to the finishing pieces as well as the weapons. In terms of advice, I think the toughest part of the model so far has been the removal of some of the excess resin. On the second image, it is possible to see the after effects of sawing off a sizeable chunk. This is just hard work rather than anything else though. The backplate vent will go over the top of this sawn off segment and hide and minor protuberance. I'd recommend giving yourself a little leeway with the sawing so that you don't slice in to the surrounding resin. The final thing I would say is that there is a lot of mass (weight) in the upper torso of this beast. Hence a good amount of pinning is going to be needed to secure the downward force at the hips. Therefore, ensure that the groin segment (seen in the second image) is pinned not only so that it slots in to the torso, but also so that it cannot rotate around. I know that this will make the model tough to transport around, but I don't plan on using it much outside my own home and with close gaming friends. I think I might have actually finished the core interior of the Warhound Titan now! After a brief moment of worry that I was missing parts, I found that the elevator segment (the floor in the picture) was in a different bag than where I expected it to be. The part in the picture forms the core of the torso of the Warhound Titan. I've painted it up following the scheme I did earlier on the other parts. Gluing here was the main problem: several pieces had to be trimmed to fit, including the Mechanicum panel, the commissioning plate, as well as the floor of the elevator segment. I'm glad that I painted all of the components prior to gluing them in to place. I don't think I would have been able to do such a job after assembly. I'm particularly pleased with the Roman numerals on the gold plate at the rear of the main wall -- a bit of practising paid off here with the scrawling! The next steps will be pinning the core of the body together, painting the Princeps and fitting him in to the cockpit, and ensuring the overall fit of the beast comes together nicely by lots of dry fitting. A bit of a blast from the past today. I was flicking through my well-worn and well-loved copy of the old Realms of Chaos: The Lost and The Damned book today, searching for a bit of inspiration. In the full colour art section from 'Eavy Metal, I came across this scene. Its a large battle between the forces of Nurgle (with Bubonicus) and Tzeentch. Count the sheer number of greater daemons contained within the image -- its immense! Just the points value alone of this diorama is amazing to think of! What a daemonic battle it is! And those colours as well! Bright and vivid, even for the more gribbly Nurgle forces -- check out those banners in particular! These days, its a lot more about realism and grim-dark influences. Its occasionally nice to see a genuinely different approach to painting like this -- even if it looks very dated. Plus the old Warhammer Fantasy scratch-build scenery is nice to witness as well.